I have a lot of favorite birds. Some I like to hunt. Some I like to watch. Some I like to listen for their song. Some I just like for their character, antics, lifestyle or other attributes. Who can’t admire a buzzard flying around most of the afternoon without flapping its wings more than a half dozen times? One of my favorites is the hummingbird; specifically, in our area, the ruby throated hummingbird. I’m sure if I lived where other species are found, I’d like them equally well. Compared to many birds, not much is known about the RTHs. Compared to others, quite a bit is known and a part of the research unlocking the truths about the hummers comes from banding studies. 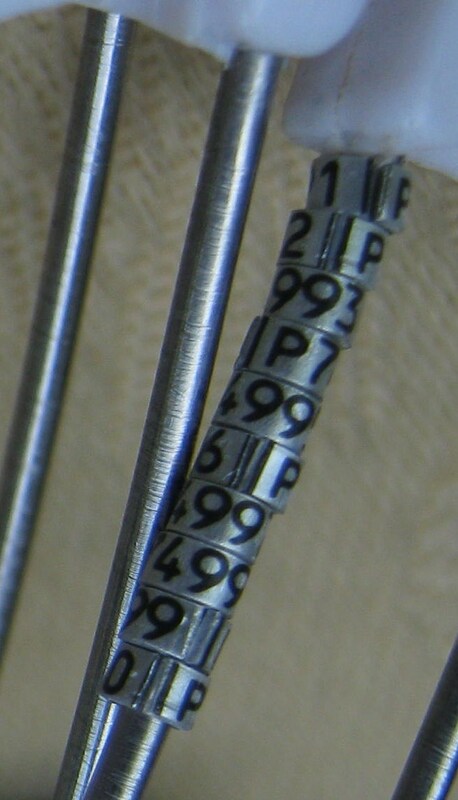 Banding is when a researcher attaches a uniquely numbered “bracelet” on a bird’s leg. Data is logged about the bird as well as when and where it was captured and tagged. Then, when the bird is found, spotted or trapped elsewhere, the band number can be looked up and more data compiled. Banding easily reveals migration corridors and the timing of migrations. 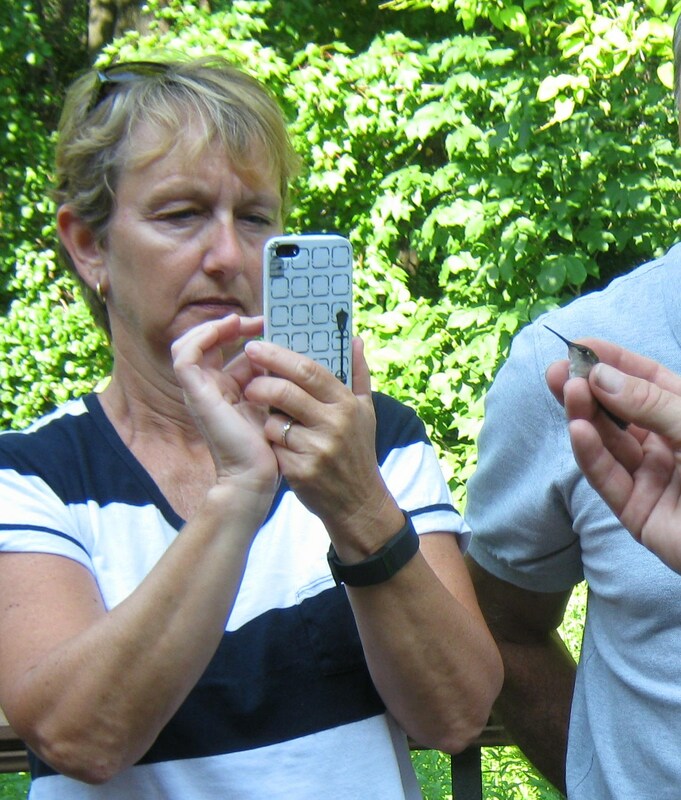 Banding can reveal how long individual birds can live. There are many other facts and details derived from banding studies. That’s why I set aside time to head to the Indiana Dunes State Park recently when a licensed hummingbird bander came to capture and band many of the hummers that frequent the bevy of feeders posted near the park’s nature center. It was an interesting morning; first, seeing the type of traps used to snare the birds, then watching the expert handle the birds, record the data and seat the tiny numbered bands on the tiny little legs. Dozens of people showed to watch the show. 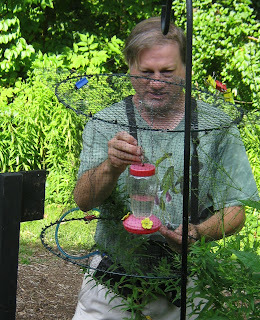 The traps were basically fine meshed nylon netting fashioned into a “birdcage.” The cage was mounted on the same hanger the hummer feeder had been dangling and the feeder itself was put inside the cage. When a hummer showed up for a free drink of artificial nectar, it buzzed around the outside of the trap searching for a way to get into the sugary syrup. In a minute or two it solves the puzzle, enters the trap and a trap monitor quickly goes to the cage to catch the hummingbird inside with a gentle touch. The bird is inserted into a soft, cloth bag and taken to the bander. The measuring, recording and banding only takes a couple minutes and the bird, surprisingly doesn’t appear to struggle much. One process is much like the first or second so we didn’t stay to the end. Last year the hummer-band-man processed 26 of the little birds in the few hours he was at the Dunes. He had three waiting to process when we left and many more to come, no doubt.